For the first time, Alaska researchers plan to use drones with thermal cameras to detect hibernating polar bears and grizzly bears on the North Slope. The University of Alaska Fairbanks team is working without dedicated funding, but is seeking industry support for the project. For now, they’re relying on UAF resources like the Alaska Center for Unmanned Aircraft Systems Integration. Federal law requires oil and gas companies to remain one mile away from polar bear dens and a half mile away from grizzly bear dens from November to April. Otherwise, they risk disturbing their hibernation with noise and vibration from vehicles and other off-road operations. Keith Cunningham is a research assistant professor at UAF and has worked on drone data and applications for various organizations. “On the North Slope right now, there are experts who are trained in chasing off bears that get too close to some of these oil production areas,” says Cunningham. “We call that bear hazing. There might be bean bags or fire crackers that are shot at the bear to scare it away. Cunningham says the drones will use specialized cameras to detect the bears. The U.S. Fish and Wildlife Service and the Alaska Department of Fish and Game have been experimenting with artificial dens for several years. Part of the upcoming UAF research will involve constructing wooden dens and mimicking body heat using a device set to about 60 watts. Weather stations outside the dens will measure conditions like wind speed, wind direction and temperature. Another device will measure snow depth and density. As they run trials, that data should tell the researchers how effective their drone is under different conditions. The goal is to provide this technology and information to oil and gas companies active on the North Slope. Cunningham says the team is interested in both polar bears and grizzly bears in the field. They will set up their first artificial den on the North Slope in early November. In the first stage, the researchers will test drones only on artificial dens. In the second stage, they’ll test the drones on bears with radio collars that send location data to a satellite. Cunningham and other researchers have experimented with thermal cameras before, but this is the first time they’ll use cameras and drones together to track bears. They’re examining camera options, and they’ve already decided on the drone they’ll use. UAF sent their first drones into Alaska airspace in May with permission from the Federal Aviation Administration. The drone can fly for about 20 minutes before it needs a battery replacement. Cunningham says drones will fly lower and more quietly than manned aircraft. Wildlife biologist Anthony Crupi works for the Alaska Department of Fish and Game and studies brown bears in Southeast. He and his colleagues use a variety of methods to trace large animals, including GPS collars and manned aircraft. While thermal imaging makes sense in the treeless North Slope, Crupi says it’s not a good fit for finding bear dens in Southeast. Cunningham says that there is plenty of interest in the bear den project from industry funders. 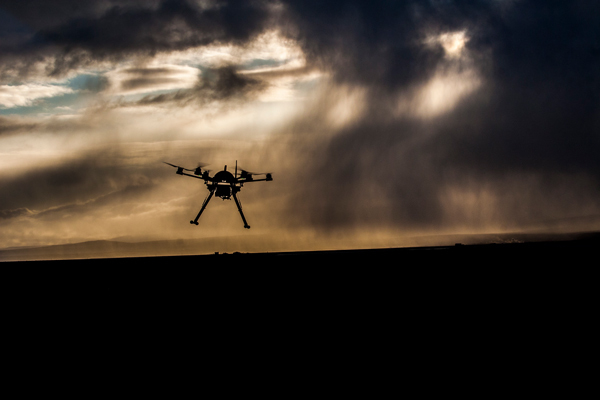 The bear den team hopes to use the drones in the field by 2016. If it’s a success, the researchers will conduct further experimentation to optimize the method.